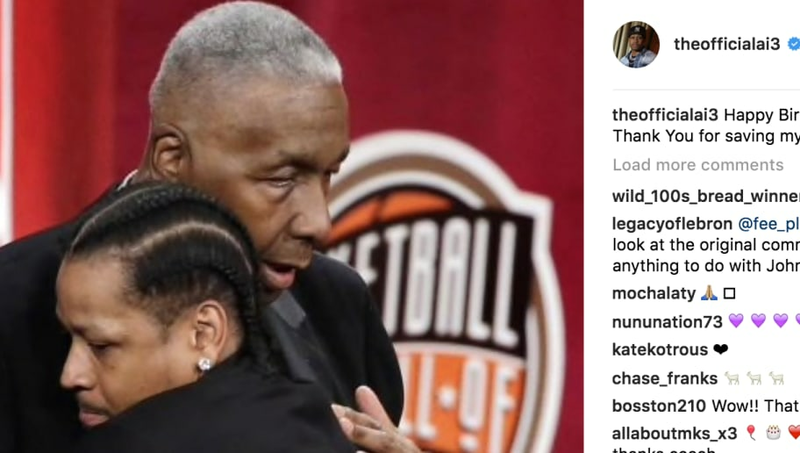 ​Former ​Philadelphia 76ers great Allen Iverson took to Instagram to wish John Thompson, his college basketball coach at Georgetown, a happy birthday. Seeing the embrace between the two and knowing the impact that Thompson made on Iverson shouldn't leave a dry eye reading this. He captioned it: "Happy Birthday Coach!!! Thank you for saving my life." ​​Before he was an NBA MVP and before he stepped over ​Cleveland coach Tyronn Lue, Iverson was a troubled kid who was even convicted of a felony in 1993. Due to this, he was removed from Bethel High School and was relocated to Hampton's Richard Milburn High, where at-risk students went to complete high school. Knowing the many uncertainties surrounding her son, Iverson's mother made a plea to Thompson, the coach of the Georgetown Hoyas at the time, to give him a chance at playing college basketball. Happy 77th birthday to Coach John Thompson! Her plea did a great deal of convincing, enough for Thompson to offer Iverson a full scholarship. Thompson became a mentor for Iverson on and off the court, and he eventually became an integral part to helping him become an NBA legend.